The best output you get when you assemble your garage waste is a brand new watch. The new Mecchaniche Veloci’s Crocodile strap 4-valve watch still shows the time as others do and looks like yet another kiddo watch in the making. It has a Royal Blue Crocodile strap along with its unique feature of 4-valves having high-precision dials with Swiss mechanical and automatic movements. 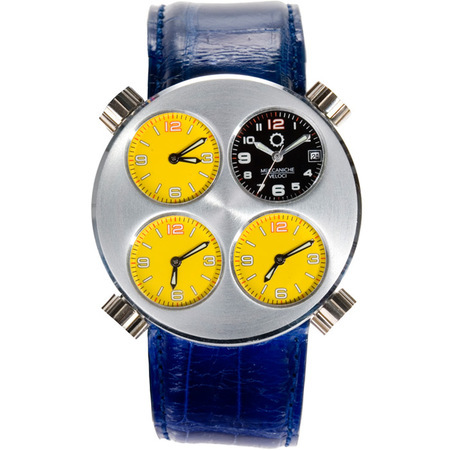 The dial colors are kiddish considering the look and feel of the watch as of a white face with canary yellow dials. Imagine, the combination of Yellow, Blue and White, it simply reminds me of my retro days when either of my uniforms or the watch on my hand use to be of same color. Special lightweight alloys worked on a lathe and exceptional hardening processes give way to a watch that offers unparalleled strength and resistance for those tough movements.